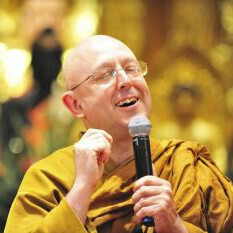 Ajahn Brahm starts off by talking about how to find happiness and joy in your meditation. The instructions according to one of Ajahn's favourite monks ‘Ajahn Ganhah’, are breath in "sabah", breath out "sabah" (meaning nice and easy). Ajahn Cittapalo suggested we count, 1 to 10, or select and visualise our favourite colour to meditate. Most of us focus on our breathing or bodies when we start or first learn to meditate. So counting or visualising a colour makes for a welcome change of pace. For beginners [and aren't we all] this is often a much easier way to start meditating. Ajahn explains how to do it and what will happen to most of us when we count or visualise our favourite colour. Ajahn then gave us a very enlightened Dharma talk, so much so that the group lost track of time with no-one in a hurry to stop or go home. Ajahn Brahm explains what this making merit business is all about and its essentiality not only for the path towards enlightenment but for a happy, peaceful life. Ajahn also describes how through the beautiful service of making merit you learn to love, care and laugh and create a beautiful pure mind. Ajahn Brahm reflects deeply on the idea “I am not good enough”. Are you good enough? Why is it that we always think it’s not good enough? Ajahn talks about how you can never satisfy the reach of what other people ask of you and to stop worrying about what other people think of you and trying to please others. Uncertainty and not knowing are part of human existence. Ajahn Brahm describes human beings tenuous hold on life or safety or happiness or health and offers advice on how to live with such uncertainty and still enjoy life, such as love, kindness happiness, good friends and so on. 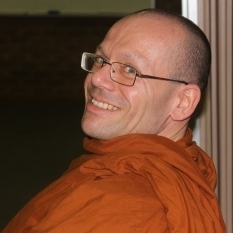 Ajahn Sujato uses this opportunity to describe his recently published book entitled ‘The Authenticity of the Early Buddhist Text’, written by himself and Ajahn Brahmali. Ajahn explains what the book’s about and why they produced it. Ajahn talks about the benefits of reading and discussing the suttas, but points out that the most important thing is your own experience of the Dhamma, understanding suffering and practising the eight fold path to overcome suffering. Ajahn Brahmali discusses the importance placed on generosity by the Buddha, how we can develop generosity and how this quality of mind supports our meditation practice. Ajahn Brahm offers many great ways of overcoming phobias, such as using awareness, compassion, kindness, catching it early, relaxing the body and so on. Ajahn reveals that some phobias can be traced to previous lives and finding out the reason behind your phobia can take away a lot of the fear, which takes away a lot of the problems. After visiting Singapore where Ajahn Brahm met many Buddhists working in the prisons to care for and help the prisoners. Ajahn Brahm decides to give a talk about the prisons of the mind and how to break free. In this talk Ajahn also recollects his visits to the prisons. Ajahn Brahmali teaches that when you keep the 5 or 8 precepts, you are following in the footsteps of the Buddha and his great disciples. Ajahn instructs us to give ourselves a sense of uplift by reminding ourselves we are doing something very good with our life. Doing this gives rise to joy in your meditation. Ajahn Brahmali explores the Buddhist idea of freedom of choice and will. Ajahn looks closely at the connection between the Buddhist idea of freedom that is freedom from suffering or problems in life, compared to freedom of choice or will. Ajahn also looks at how our choices and intentions affect us. Venerable Hasapanna expands on the first noble truth, that life is inherently unsatisfactory. Venerable talks about how life is beyond our control, things happen according to causes and conditions and therefore all we can do is make the causes we want and let them unfold. Responding to a request to talk on the Buddhist idea of the art of love for Valentine’s Day. 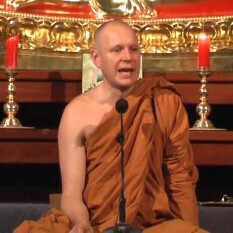 Ajahn Brahm gives a teaching on what romance or love actually is and how it works. Ajahn Brahmali reflects on the meaning of Secular Buddhism, the need for it and whether Buddhism’s really a religion in the first place. Ajahn takes a look at how Buddhism has changed and adapted in western culture and the risks of Buddhism changing too much. Ajahn Brahm offers a deeper and broader understanding of mindfulness. Ajahn talks about the development and benefits of mindfulness and meditation, how it actually works and its role in the path of practice. Venerable Mudito encouraged us to lift our self confidence by looking within, asking if we respect ourselves. Be kind to ourselves and in so doing lift our self confidence. Venerable then guided us through a 30 minute meditation using our bodies as the focus, totally relaxing us in the process. The mediation was well suited to beginners and intermediates. He then gave a Dharma talk to further encourage us to look inward and boost our self confidence. During Q&A he explained how he came to be a Monk and why it is so important for us to be kind and respectful to our selves. We look forward to Venerable returning to The Armadale Meditation Group. 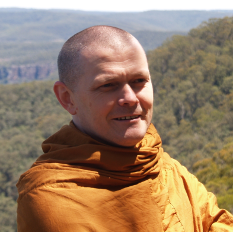 Ajahn Sujato talks about the relationship or connection between our environment, climate change and the Dhamma, Buddhism. Ajahn takes a close look at how our existence is interdependent with our environment and everything going on around us and reflects upon how to deal with our emotions about climate change such as despair, depression and fear of the future. Ajahn Brahm offers a Buddhist attitude and perspective towards climate change and the environment. Ajahn gives this talk to help relieve people’s underlying fears about climate change and generate some solutions. Ajahn begins by talking about an interesting metaphor in the Jataka tales (suttas) about climate change. And Ajahn also talks about reincarnation being a good reason to care for the land we live on. 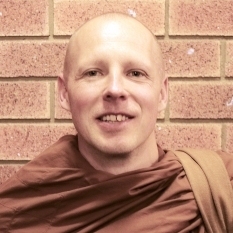 Ajahn Brahm dedicates this talk to those of us living alone or without a relationship, however he says this talk is also relevant to those in relationships. Ajahn elaborates on the Buddhist principle or the basic law of karma that what you are experiencing right now is the result of your karma from the past and you can’t do anything with it. The most important thing is not what you have to deal with in life, but how you deal with it. In other words what are you making out of what you have. Ajahn advises us to love and appreciate ourselves and others and stop trying to change and improve ourselves and others. What if this is your last meditation? Ajahn Brahmali begins by giving a short Dhamma talk on the skilful ways of establishing yourself in the present moment. Ajahn teaches us that by contemplating death, thoughts about past and future fade away. Ajahn suggests to contemplate death at the beginning of the meditation to remind us that the past and future are irrelevant and help remove restlessness and tiredness.